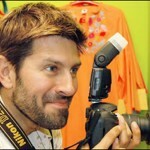 Tapu Javeri, Top Photographer of Pakistan was born in 1965. Tapu Javeri is one of the foremost photographers in Pakistan, both in terms of fashion and art photography. Fashion photographer, jeweler model, artist or the many things that Tapu does – it isn’t what he does that always makes him the centre of attraction but the way he looks. Though he has worked with the country’s leading newspapers and magazines for the past decade, Tapu is now concentrating on his new role as photo-editor of the magazine, Xtra.In the late 90’s Photographer Tapu Javeri broke into the art scene by generating mixed media photo paintings. Photographers are the people who possess the ability to change the looks and scenario through the lens of their camera and with the lens of their own eye. Tapu Javeri new photo-art is heading off the dynamic new wave of photography that has hit the country.The new dynamic photo art of Photographer Tapu Javeri is a tremendous addition in the world of photography. Concept Photography is an emerging concept in Pakistan, Photographer Tapu Javeri is also especially credited to introduce it. We had quite the time reliving Tapu’s adolescent memories. And we have to say – this ace photographer has always been innovative with every passing year, he seems to look even better, and can carry off anything with effortless grace. In this post we showcase some extremely charming examples of Tapu Javeri Fashion Photography. This kind of photography is usually used for advertisement purposes, but now with the advancement of fashion industry it has now become a field of its own. We hope you’ll like this collection. Kindly feel free to express your views on Fashion Photography of Tapu Javeri and do let us know if we have missed your favorite one. We would try our best to include it in our next post.